So, after spending many years steering clear of the chocolate frenzy around St. Valentine's Day, this year I have finally stepped into this tempting sweet little world of chocolate: Salon du Chocolat in Tokyo. The show was held from Wednesday the 21st to Monday the 26th of January (followed by other locations in Japan), and I opted for the first day of the event - and in the morning. Although this was my first time ever to be at the event, there was one thing I was sure about, and it was very clear: it will be crowded, no matter when you hit the place - it's just a difference of having many people or even more people. Some would try to come early in the period to score what they are eyeing; others might have no choice other than coming in the weekend (the peak period); and yet others would be last-minute and just make it on the very last day. I was determined to avoid the weekend slot, definitely; and as it was going to be my first time being there, I might as well see things in full on the first day, I figured. I had heard too many stories of those hard-to-get, Salon du Chocolat-only items flying off the shelves very early on. So there I was, soon after the Isetan department store in Shinjuku (where the show took place) opened for the day at 10 am, meeting and greeting N, an aspiring patissier who was visiting Tokyo in time for this event and the very person that had written to me for Tokyo chocolate/pastries recommendations. When we got to the venue on the 6th floor, there already were quite a few visitors, but not as many as I had expected. Not too bad, I thought, yet my hope was soon crushed when we headed for our/my first destination: Chocolat Bar, which was basically an area fixed up for people to sample a selected range of bonbons from most (but not all) of the participating shops with a cup of coffee or tea - or a glass of white Burgundy if you are up for it (I was tempted, but held back!). 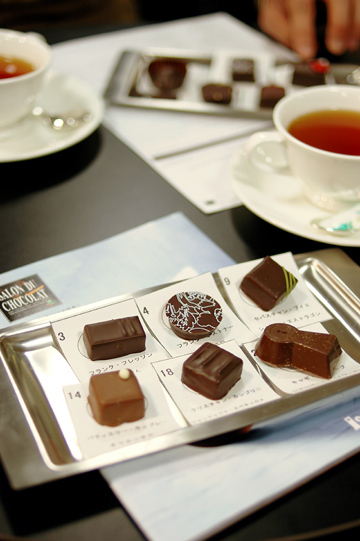 The idea is for visitors to pick and sample an assortment of chocolate from different shops before, or instead of, grabbing a pricey multiple-piece box from shops that they have never tried before - or maybe alluring them into reaching for things that weren't originally in their shopping list. So it was not, by any means, where you'd come to rest your feet or chat with your company leisurely over a cup of tea; chances are you'd find a long, long line of people on the wait, which there was when we arrived. Well, everyone's got the same idea, we laughed, and just joined at the end of the long line, which quickly got longer behind us. While in a line, you'd get a list of chocolate on offer at the bar so that you will have made up your mind what to have by the time you (finally) place your order. 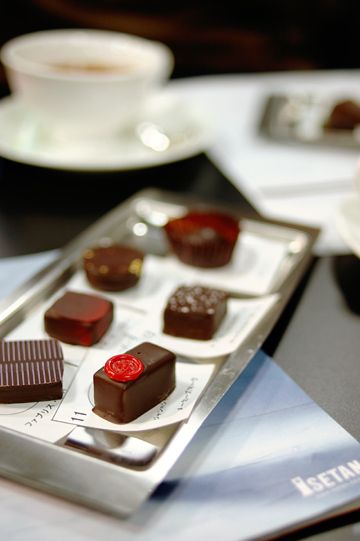 Here you basically had a set of three pieces of bonbons of your choice along with a cup of tea of coffee (not the Burgundy, unfortunately, which you'd have to order separately), and you could add another three pieces with an extra cost. Being greedy passionate about chocolate, each of us got six pieces, making sure no two pieces were the same. So this got us a total of twelve different pieces of chocolate from twelve different shops, and we shared every single one of them. I know you could eat a whole piece (or more, really) in one go, but when you paid about 300 yen per piece, you really do want to savor it! 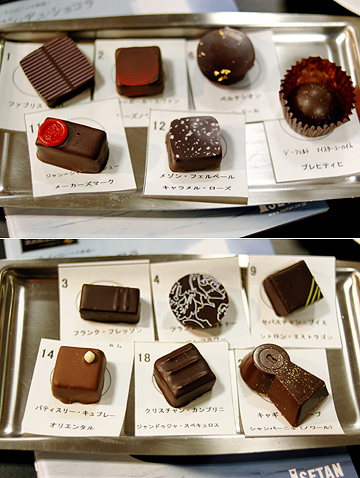 Top (clockwise from the top left): Complexite, ganache with balsamic vinegar from Modena and strawberry jelly, coated with dark chocolate, from Fabrice Gillote; Rose Noir, raspberry and lychee ganache and almond cream, coated with dark chocolate, from Jean-Paul Hevin; Palet d'Or, dark chocolate ganache flecked with gold leaves, from Bernachon; Praechtig, praline flavored with lychee, grapefruit, and vanilla, from Bernd Siefert (with Meister Juchheim); Caramel Rose, rose-scented ganache from Maison Ferber; Maker's Mark, bourbon-infused dark chocolate ganache from Jean-Charles Rochoux. Bottom: Autumn, chestnut cream ganache, from Franck Fresson; Sunflower, praline with sunflower seeds, from Franck Kestener; Citron Estragon, lemon- and tarragon-infused ganache, from Sebastien Bouillet; Cagi de Chocolat Champagne Noir, ganache with Moet et Chandon champagne, from Cagi de Reves; Gianduja Speculoos, praline with pieces of speculoos (gingerbread cookies), from Christian Camprini; Oriental, lychee ganache, from Patisserie Kubler. * Names and descriptions of bonbons are a rough translation of those provided on the menu in Japanese; some of the names might not be accurate. For details of individual shops, see the list of participants here. There were a total of 31 bonbons on the menu, which means we got to try just about a third of all. You might have noticed that our choice is more or less on an exotic side with all those relatively unusual flavors for chocolate, and that was exactly what we were after; there were, of course, more standard or plain bonbons available, but we went for more interesting combinations of flavors. Basically, all of them tasted good (to me anyways), except maybe one that tasted more like smoky incense than chocolate (let's leave it unnamed). I particularly liked the sunflower seed and speculoos pralines, both of which were crunchy and flavorful. But what both of us agreed was exceptional, ironically, was the one that was the simplest of all: a gold-flecked dark chocolate round so aptly named Palet d'Or, from Bernachon, a family-run chocolatier based in Lyon, France. It is simply a rich and smooth dark chocolate ganache, with no unusual flavoring or anything, yet it has incredible depth of flavor in a small piece, with a hint of coffee and caramel, almost. It was sensational. And that pretty much set my mind on where to turn to when we left the bar; Bernachon, of course. And there we encountered with a second long line of the day, which went even longer than the one we were in for the Chocolate Bar. It took us about an hour and a half or so to reach the showcase - and honestly, I'm not someone who is willing to wait for more than half an hour just to get in a restaurant or buy something. It was only that I was so awe-struck by the quality of their chocolate, and the fact that they were available only here, for the limited period of time until St. Valentine's. Or perhaps, I was on a chocolate high - yeah, maybe. Whatever the reason might have been, I was so thankful that N made my company while in line, making the wait seemed much shorter than it actually was (phew!). By the time we had spent more than an hour in line (and the amount of money you wouldn't normally pay for a box of chocolate), it was already well past 1 pm. 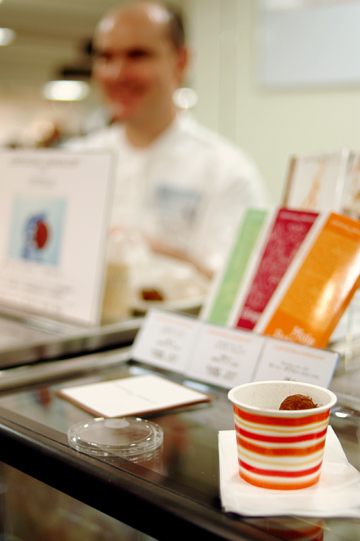 From there, we took it a little easier and poked around different booths, sampled more chocolate, and talked to some of the chocolate professionals who attended the event. From top left: Chocolate hat and other accessories, by Jean-Paul Hevin; Mr. Gerald Coleman of L'Artisan du Chocolat, writing his autograph for a customer on the package of a chocolate stiletto heel; Ms. Christine Ferber, writing her autograph on the cover of a jar of her famed Maison Ferber spread; salted butter caramel ice-cream from Henri Le Roux; chocolate and gianduja spread from Guido Gobino; Ms. Chloe Doutre-Roussel, an internationally acclaimed chocolate buyer and taster, at the El Ceibo booth. I didn't get to take too many pictures, but there were a bunch of beautiful chocolate sculptures and ornaments as well as accessories, all artfully presented. 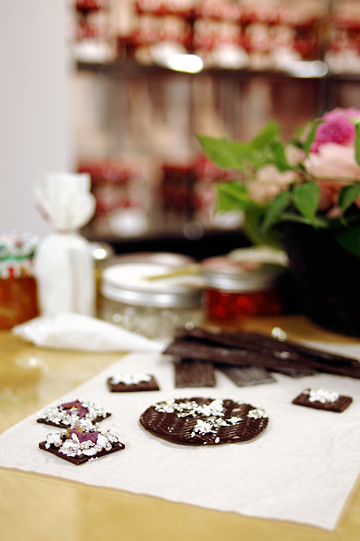 The theme of this year's show, in fact, was 'chocolate and art'; it was fun to see large, magnificent centerpieces or small, jewel-like treasures, all too pretty to eat! There seemed to be a lot of chefs and owners of participating shops around, networking with their peers or chatting with enthusiastic visitors, and generally busy posing for photo shoots and writing autographs. There were just a few of them I actually talked to, as there were way too many people there and I was generally overwhelmed by the fervor. Glace au C.B.S., from a French caramelier and chocolatier Henri Le Roux. In Japan, they are best known for their caramels, especially the signature C.B.S., which stands for caramels au beurre sale or salted butter caramel. While you can buy their caramels and other products anytime at their outlet in the Isetan department store, the ice-cream was available ONLY at the Salon (Japanese people have a particularly soft spot for anything 'limited-edition'), so I had to try it there. 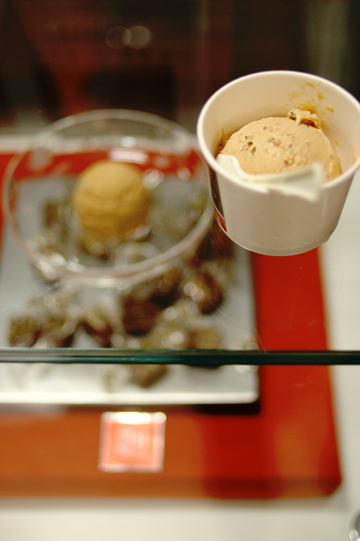 The ice-cream itself is made using C.B.S., with chunky pieces of almonds, hazelnuts, etc. It was so rich that even the small scoop seemed quite a lot to me - it was a kind of ice-cream that you would savor just a spoonful or two at a time. A set of icy bonbons from L'Artisan du Chocolat, a London-based chocolatier that has pioneered the fine chocolate industry in the UK. Their signature Salted Caramels, dark chocolate-encapsulated sweet liquid caramel with a hint of sea salt, are now turned into an ice-cream-like little balls filled with frozen aerated flavored ganache. I think they were called Cryollo, if my memory serves me right - yet I couldn't find the information anywhere on their websites, so I could be wrong. 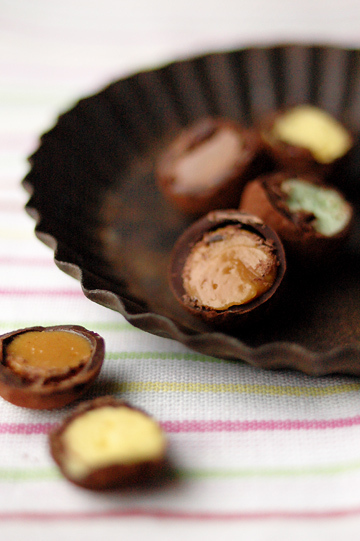 These little cuties came in four different flavors: cocoa, caramel, mint, and passion fruit. At the counter, Mr. Coleman was offering samples and I tried the mint and passion fruit ones, both of which were full of flavor and tasted really refreshing - cool, light and airy. Because they were essentially a freezer section product and Isetan did not allow them to sell frozen items to-go at the show, they offered these little icy things for snacking while browsing at the event. But I heard that it should be okay to take them home anyways (at my own risk, so to speak), and it was. They made it home safe and intact. Stored in the freezer, they were totally fine when I finally had them a couple of days later. So this was how I spent the day full of chocolate at the show. I was shuttered when I got home! Still, I passed on most of the samples offered at counters - well, I probably did take quite a few to be honest, but before coming to the event I thought I was ready to try samples from every single one of the shops! It never happened, really, but that doesn't mean I should pretend that I did not eat a lot of chocolate, I know - as if I forgot sampling twelve (halves of) bonbons at the very beginning! There was just one thing that I wish I had had, though. And coincidentally, it was also a frozen item: there were a couple of chocolate desserts created specially for the show from a collaboration of Jean-Paul Hevin and Maison Ferber: frozen chocolate mousse with fruit sauce, one dark chocolate with raspberry and the other white chocolate with pineapple-mango-passion fruit. I thought they sounded good, but when I think about it, there were only 50 servings each on offer per day; they would probably have all gone by 10:15 in the morning, I reckon. Like I said, it was my first time being at the show, and while the one in Tokyo must be the largest of all in Japan, it appears that other locations, too, had their own things going on, such as cooking demonstrations by visiting chefs and another array of Salon du Chocolat-only dessert offerings. Although it was really fun, considering all that hype and the amount of money I tend to spend, I'm not certain if I would want to come back to the event next year... well time will tell, I suppose. ... Next up: yet more chocolate I took home from Salon du Chocolat (to be posted here). And yes - Happy Valentine's Day to you all! Hey Chika! Its N here! Great post and great photos! Gotta learn how you take those great shots coz mine really pale in comparison. Its been crazy since returning to London and hope to be back in Tokyo before long. Looking forward to your future posts. Great time hanging out with you and all the best in your future travels! I love your beautiful food photos! What do you shoot at to get the beautiful blurred background even when it's close to the foreground? Hey!!! Those are beautiful... is this Trishy? Just wondering. I absolutely LOVE chocolate. Your photography is absolutely stunning. And drool-inducing. 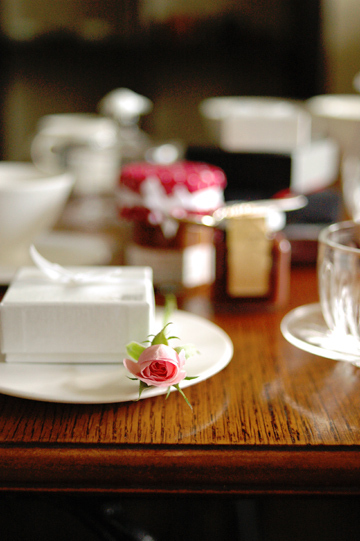 Those are beautiful chocolates- but what's really exquisite is your photography. What a pro. what a wonderful and lovely posting....pictures looks cool.